Saturday, November 18, 2017, 7-10 pm – You are invited to the Omni Commons to view a special work-in-progress screening of Zapatista Moon, a feature documentary depicting the role of women in the revolutionary Zapatista movement. The film highlights the December 2007 Meeting of Zapatista Women with the Women of the World. This focus on indigenous women coincides with the current independent candidacy of an indigenous woman on behalf of the Indigenous Governing Council. Tamales & Aguas Frescas, Zapatista Artesanía & T-Shirts available. Sponsored by the Chiapas Support Committee and endorsed by Liberated Lens. As planned, María de Jesús Patricio Martínez (“Marichuy”) toured the 5 Zapatista Caracoles from September 14-19. Some of her talks are translated into English and published on our blog. Some news/analysis articles about her tour are below. !. Marichuy denounces INE’s system for collecting signatures via cell phone– Chiapas journalist Isaín Mandujano reports on Marichuy’s visit to the city of Palenque, where she denounced how the system of theNational Electoral Institute (INE) system for electronically submitting the signatures necessary to get on the ballot discriminates against the poor. Mandujano also gives a description that helps us understand what Marichuy and her supporters must do to get her name on the ballot for the 2018 presidential election. 2. Marichuy, a very different campaign– Luis Hernández Navarro weaves together the origins of the National Indigenous Congress with the participation of María de Jesús Patricio (“Marichuy”) and her current independent campaign for the presidency of Mexico in 2018. “We don’t carry drums of war, but rather banners of peace.” An important analysis and description of Marichuy’s visit to the Zapatista Caracoles. 3. 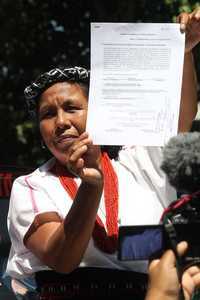 María de Jesús calls to organize the “pains and rages” of the peoples – Marichuy registered with Mexico’s National Electoral Institute (photo above) and announced that she would not accept one single peso from the Mexican government. This entry was posted on October 31, 2017 at 6:02 pm and is filed under Uncategorized. You can follow any responses to this entry through the RSS 2.0 feed. You can leave a response, or trackback from your own site.